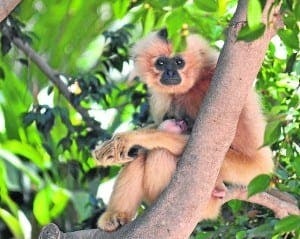 THIS is a baby golden-cheeked gibbon, a seriously endangered species found in BIOPARC Fuengirola. With less than 25,000 left in the wild, the birth of the gibbon at the start of June is being lauded as a symbol of ‘hope’ for the conservation of the species. The mother, Ares, was in fact the first baby gibbon born in Spain. And the father, Den, arrived at the park from Bratislava Zoo, Slovenia, in 2012.